Saturday was a great day, with the arrival of Paul Goodman and Brian Louden to complete the team for this visit. It means that we can split up to pray for people, go to more meetings, and – hopefully – have a bigger impact even than the astonishing first week. Paul and Brian have been brilliant, after a full day nearly of travelling: they’ve come having hit the ground running, nd been brilliant in the middle of their jet-lagged-ness. Saturday, in two churches – Brian with me, Paul with Chris: ‘Casa de Oracion Rey Jesus’ is one of the churches I love dearly. It’s a church where one lady in particular, has been blessed by God many times – Astrid, healed now seven times of different cancers, so lovely to see her looking so well! It’s just such a lovely blessing to be greeted like a member of the family in many churches now, this one especially. I preached, Brian shared his testimony: then he prayed for a good number of people, while I focused initially on one lovely young lady in a wheelchair, Maria. She was shot 8 months ago, paralysed: the doctors had said she’d only ever be able to move he eyes, and experience great pain. She was already moving more than her eyes but still – understandably – traumatised, and angry. Saturday, the pain in her hands was off the scale, and she looked full of hopelessness. A number of things happened for her: ALL the pain in her hands went, among other things, but what came – wonderfully – was hope. I suggested we’ll see his during this week to pray more: I have a real sense of hope that she’ll be walking… I prayed for a few others after her, and between us, Brian & I saw some lovely healing. Paul and Chris prayed for 17 people in their church, a Presbyterian church, and everyone was healed. Thank you Jesus!! Yesterday, up at the crack of dawn to drive to Tulua for 5 meetings. Paul was with me. He preached brilliantly, and of the 200+ who were in he meeting, we must have prayed for at least half of them. EVERYONE was healed. It was a wonderful morning: maybe the name of the church had something to do with it! It’s called ‘Iglesia Hacedor Miraglos’ – Miracle Maker Church. Why don’t we call our churches something wonderfully creative and faith building like that? And the pastor is called Habakkuc…. It was a fantastic morning. Chris and Brian had a great time too. In the picture above is our lovely translator, Sarah: brilliant! – and the lady to her left was the first one I prayed for. She had a broken arm, and was in great pain, but I’d seen her worshipping God wonderfully, raising the arm she COULD raise. 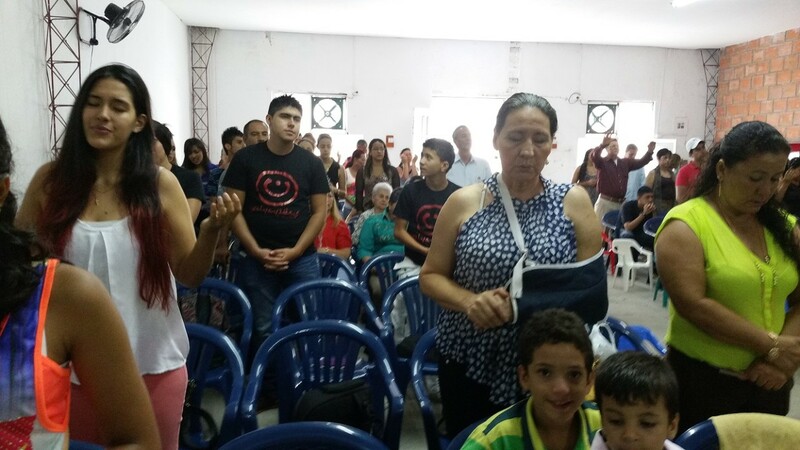 God healed her broken arm instantly, off came all the protection, and away went all the pain…. 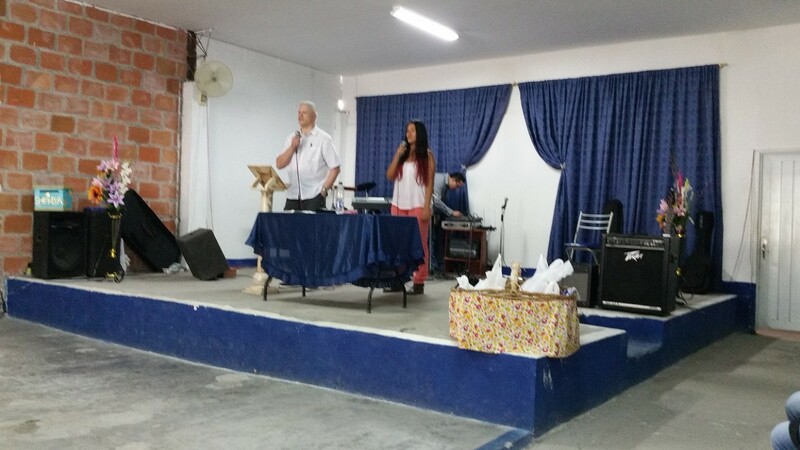 Then two more churches: Paul & I were at ‘Iglesia Manantial de Agua Vida’ – Fountains of living water – soooo much nicer than ‘****** Street, ****** church(denomination)…. why doesn’t God ‘do it’ in the west? Perhaps part of the answer is in the names! As in the morning, Paul and I organised a ‘fire tunnel’ for the people to walk through: in both meetings, people were healed, filled with the spirit, healed emotionally, just as they passed through it. Prayed for many: all healed – some totally, others in process. 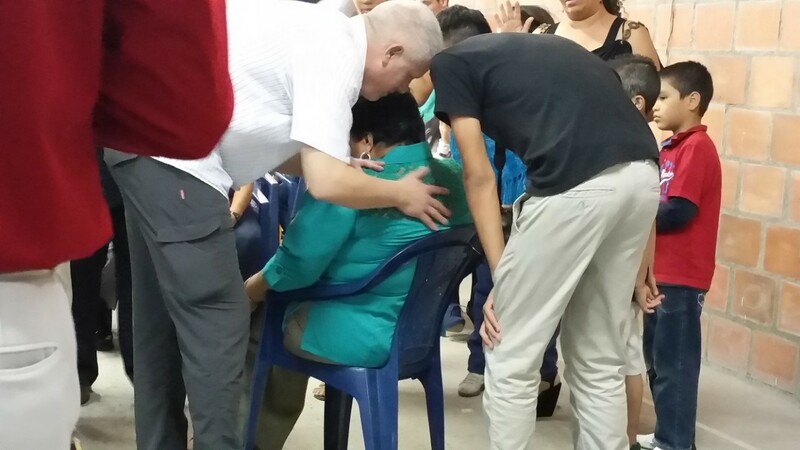 A lovely lady in a wheelchair was so blessed, with pain going, the power of God pouring through her…she didn’t get up and walk out, partly because she’d had both legs amputated. I told her a Smith Wigglesworth story about a pastor with no legs to whom Smith told to go and buy new shoes the next day. He got legs as he put shoes on the stumps. I pray that this lady will do the same today. Fabulous day, wonderful start for Paul and Brian: still this trip is on an upward ascent in terms of what God’s doing. If the blogs keep going the same way, I’ll keep writing them, whatever time of night, however tired. If they don’t, well, I’ll then assume only a very small handful of people are interested in the testimonies of Jesus….and probably stop posting them. « How do I title the last two nights’ meetings? Running out of adjectives already….